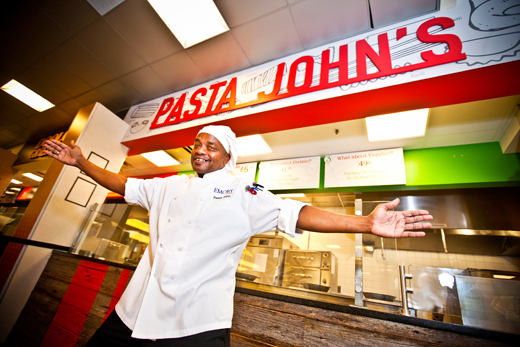 "Pasta John" Wilson celebrates his new storefront in Cox Hall Market. Sitting in Cox Hall Market a few feet from his new namesake storefront, "Pasta John's," longtime Sodexo cook John Wilson smiles and shakes his head as if he can't believe his good fortune. "I give God all the glory in that," says Wilson, who has spent the past 15 years working in the Dobbs Market dining hall, feeding thousands of students and becoming a beloved favorite for serving suppers with a smile, sage advice and a song. When the departure of DBA Barbecue left an opening in Cox Hall Market, students on the Food Advisory Committee Emory (FACE) "unanimously" asked for a pasta option, says David Furhman, senior director of Emory Campus Dining. "At the same time we recognized the popularity of the pasta station at Dobbs and made the connection with Pasta John," Furhman says. "Because of his great reputation with students, we asked Pasta John to run the station and named the space for him." The new station, which opened Aug. 19, offers several varieties of pasta, including cheese ravioli and traditional semolina pasta, plus whole wheat and gluten-free options. Pastas come with a choice of Alfredo, marinara or pesto sauces from Wilson's own recipes and the option to add chicken, Italian sausage, meatballs and a variety of fresh vegetables. Wilson sees the new station as a homecoming. He worked for Emory at Cox Hall as a dishwasher and pizza cook from 1992 until 1996, when he left for Tampa, Florida, to teach cooks at a national chain restaurant. There he fell in with a bad crowd and became involved with drugs and alcohol. He found himself neglecting his family and his health in pursuit of the next high until a medical crisis snapped him to his senses. I did that and survived, I got on my knees and prayed. I said, 'God, I can't do this on my own.' The very next day I got busted and that laid the foundation for me to get my life back on track. When I came to Atlanta, I only had one friend up here, but I knew I had to get away from the situation I was in." On Aug. 23, 1999, Wilson started a new job with Emory as a cook in the Dobbs University Center (DUC) dining hall. Since then he's met thousands of students — he's famous for his recall of names — as well as parents and Emory faculty and staff. I never would have otherwise," he says. Wilson enjoys working face-to-face with students, sharing in their new experiences and offering kindness and guidance. "One thing about my students is I know how they feel. They are away from home and they have no family around and I know how that feeling is," he says. "I try to be like family, like a big brother for them." In addition to Pasta John's in Cox Hall Market, Emory's campus dining debuts several more options this fall. "We have made a conscious decision to be more deliberate about the partnerships we forge," Furhman says. "We want to include local businesses and national brands whose quality is consistent with our own standards and specifications from the standpoints of quality, sustainability and service." Peet's Coffee and Tea will replace Jazzman's Café in the Robert W. Woodruff Library. Peet's will offer coffees and teas from the San Francisco-based company, as well as a small retail store of Peet's items, plus baked goods from Highland Bakery and panini sandwiches and salads from campus dining. An expanded menu at Freshens Yogurt in Cox Hall includes crepes, rice bowls, salads and self-serve yogurt and toppings by the ounce. A new partnership with Atlanta chef and restaurateur Linton Hopkins will bring H&F Bread Co. breads to Dobbs Hall Deli, the Boar's Head Deli in Cox Hall Market, and Emory Catering. Emory Catering also debuts new menus for student groups with lower-cost options. Construction is beginning on Eagle Convenience and Subs, a new made-to-order sandwich station and convenience store located in the space formerly occupied by the faculty dining room in the DUC. The new shop is slated to open in mid-October, after fall break, and will offer evening and late-night service seven days a week. All beef served in Dobbs Market will be humanely raised, locally sourced, grass-fed beef and all eggs will be from American-certified humanely raised cage-free chickens. A new mini Starbucks Coffee station will be added to the Rollins Café at Rollins School of Public Health. The new Faculty and Staff Meal Deals will offer discount pricing for all meals at Dobbs Market — $6 for breakfast, $7 for lunch and $10 for dinner — plus a buy-three-get-one-free deal with CINCH punch cards available at Dobbs Market.